Bikewell CIC is a not for profit community organisation run by two local female volunteers in Northern Lincolnshire, organising women's specific cycle workshops to encourage more women to cycle and experience the health benefits both physical and mental well-being as well as feeling safe on the roads. With an experienced British Cycling level 2 Coach Bikewell CiC supports females to learn the skills needed to be confident to cycle on the roads. Prior to Bikewell CiC we were both Ride Leaders at local Sky Rides and as Breeze champions which involved leading female only bike rides across the North and North East Lincolnshire area as well as supporting other females to become ride leaders and developing the number of opportunities for females to cycle across the area. Bikewell CiC organises practical workshops such as how to take your wheels on and off, how to fix a puncture and change an inner tube, what equipment to carry and everything you need to know about the bike and kit. We also organise coached sessions teach you bike handling skills, using gears properly, safety on the road and group riding, all in a safe environment. We have also introduced women to mountain biking and off ride biking and have run workshops on route planning. 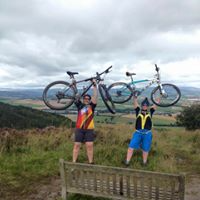 We have both been riding bikes for many years and understand the barriers in place for females taking up cycling, as well as the physical and mental benefits of being involved in cycling. We have also been involved in either cycling or sports development for several years and have a passion for promoting and encouraging physical activity. We knew from volunteering through the Breeze program that cycling had made such a difference to the female participants lives – increasing fitness levels, improving confidence, helping people to lose weight, supporting the development of friendships and we wanted to further develop the opportunities available in North & North East Lincolnshire. Being able to support more females to take up cycling and developing skills and knowledge of other females has led to us being able to develop the network of female bike leaders and provide even more opportunities for females to ride in our area. So many women have said getting involved with cycling has made a massive difference to their lives from fitness, confidence, learning new bike skills, feeling safer on the roads, losing weight, meeting new friends and having a whole new social circle, entering Sportives and some have gone on to join local clubs and start racing. What would you say to someone who's thinking of getting into coaching/volunteering? It's a great way of being involved in something you are passionate about and being able to help others to get involved in that activity and helping them to make massive differences such as gaining confidence, losing weight, meeting new people etc.